Lectured at Centre for Japanese Studies in South Africa. On 26th June 2012, our Representative Keiko Yokoi lectured with the theme of “Power of the words is infinity” at Centre for Japanese Studies which were opened in Johannesburg. 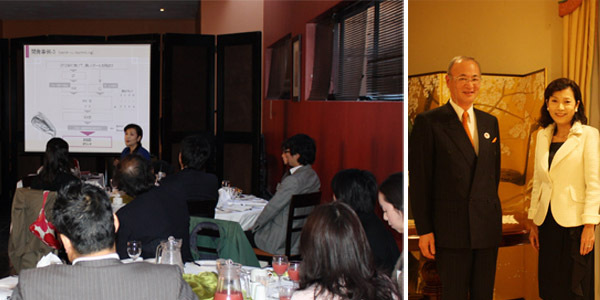 The Japanese Ambassador in South Africa Mr. Yoshizawa, people about embassy and business-people living in Johannesburg attended that lecture, there Keiko Yokoi held the presentation about Brand-name Development with “Power of the words”, and our grateful feelings which we want to deliver for Great East Japan Earthquake Recovery Support. We were invited to the dinner party at the official residence in Pretoria, and we could have a joyful and meaningful time there with them.